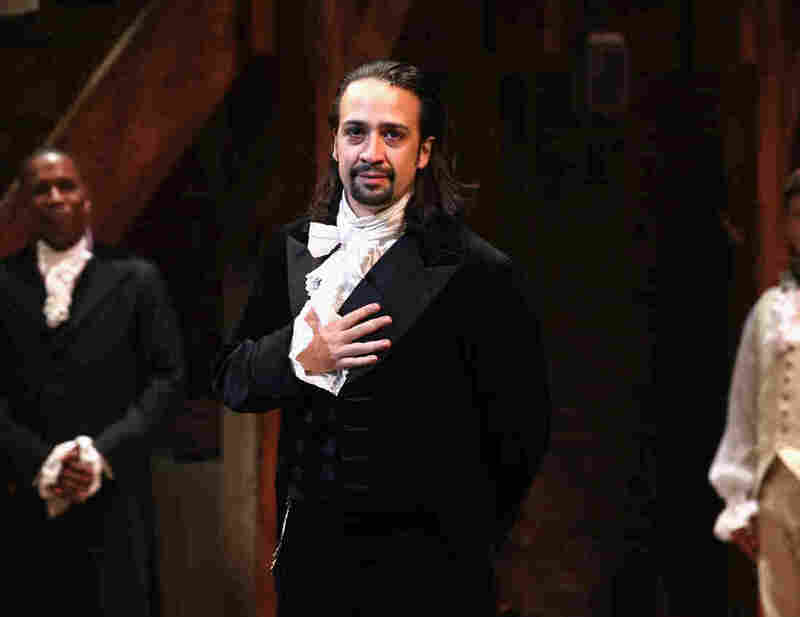 Lin-Manuel Miranda Talks 'Hamilton': Once A 'Ridiculous' Pitch, Now A Revolution When the Broadway musical's creator said the life of Alexander Hamilton embodied hip-hop, people laughed. Now, he's written a book about the national phenomenon with former critic Jeremy McCarter. The Broadway musical that's set during a revolution may have set off a revolution of its own, too. Right now, Hamilton is the hardest ticket to get on Broadway. It's been called a once-in-a-generation experience. But it's safe to say the unconventional smash wasn't always a sure thing. The Grammy-winning show portrays the life of Alexander Hamilton, a founder of the United States who was once a poor, orphaned boy "dropped in the middle of a forgotten spot of the Caribbean" — and it does so in the rhymes and music of hip-hop and pop. "I understand how ridiculous the elevator pitch for this show is," Lin-Manuel Miranda — the composer, lyricist and lead of the show — tells NPR's Scott Simon. "It sounds improbable. And then once you start hearing about Hamilton's life story, it sort of makes sense. The mode of storytelling makes sense to the subject." He says that idea was the seed of what would eventually become a six-year-long project to bring Hamilton to the stage. "That was what grabbed me about it," Miranda continues, "was this was a guy who used words to get everywhere and do what my favorite hip-hop artists do — if not write about their struggles, their lives, then transcend their circumstances by sheer virtuosity." 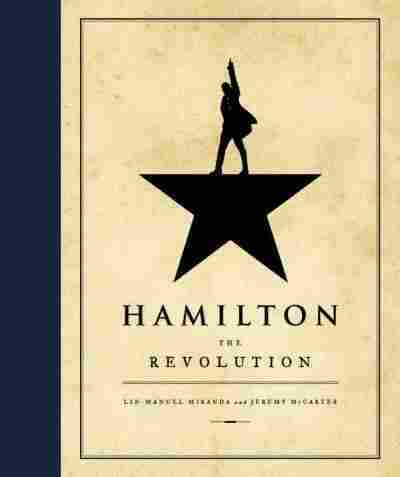 Now, the play's creation is the subject of the new book Hamilton: The Revolution, which Miranda co-authored with former drama critic Jeremy McCarter, who was involved in the production at its early stages. And, as Miranda recalls, those early stages fittingly included a crucial spark from the White House. In May 2009, at An Evening of Poetry, Music And The Spoken Word at the White House, Miranda was expected to perform a number from In the Heights, a musical running on Broadway at the time that he wrote and starred in. But he decided to try something else. "When the White House calls and says, we'd love for you to perform, or if you have anything else on the American experience, and you have a hot 16 bars about Alexander Hamilton in your back pocket, my choice was clear," Miranda says. "It actually felt like a sign, that the thing I had been working on in my spare time, there might be an audience for it." Jeremy McCarter: Well, I'd grown up listening to hip-hop, and I'd grown up enjoying the theater, much as Lin had. And what I couldn't see anybody doing was the thing that seemed obvious to me — making the connection between these two art forms. I mean, if you think of hip-hop as being, in addition to a form of pop music, a kind of verse storytelling, then hip-hop is doing what the great playwrights of the past used to do. I saw a lot of people strike out, not really understand how to make the two work together. Someone named Will Power, I thought, did a really nice job doing it in a couple of projects, but I was still on the hunt for someone who I thought might see it the way I did. Then, I went to see In the Heights. Empathy only gets you so far. When you're participating in a system of brutality and it's a part of your daily life, you know, there's a great quote from Chris [Jackson] in the book, where he says, "I can't reconcile that. I can't wrap my head around that. I can honor the parts of him that we honor." There's a moment in the show that you wouldn't get from the soundtrack, but there's a moment at the end of the show where Eliza says, "I speak out against slavery; you would have done so much more." And it's right after the Washington Monument moment, and Washington hangs his head in shame and steps back. And we deal with it in a lot of ways, big and small, but it was an open thing and a thing to grapple with because it just was a way of life that no one knew how to deal with, and we grappled with it as much as we could — and still tell a story in 2 hours and 45 minutes in a musical. McCarter: You know, I talked to Stephen Sondheim about this — not about the Coolidge musical specifically, although a Coolidge musical by Sondheim would be pretty amazing, I think. You know what happens: Something like Hamilton comes along, it changes the sound of Broadway. Lots of people have new ideas because of its success, what is it going to look like for a while? And Sondheim's been around long enough to see styles come and go and changes happen. And he said something really smart, that the important thing that's going to come out of this is not going to be the copycat shows, the shows that try to take the direct model of this, stylistically or in terms of subject. What's exciting about this is that people will see it and feel encouraged to express their own voices more freely. That, in a sense, much like Sondheim shows, it broadens the possibilities of what you can get away with ... to do whatever you want. And that, to me, is one of the most exciting things about this whole, crazy phenomenon, is to think about, all the doors are going to open because of the kids who are coming to see it. Miranda: I kid you not, I had two historians hand to me two different books on the way to the studio today. ... I say, "Thank you very much." Because it's coming from a place of enthusiasm, it's coming from a place of, "Look what you did." So, I can't help but be touched by it. A Hip-Hop Soundtrack For A Musical About Alexander Hamilton? Sure, Why Not?